Four Things to Take Away From the Ferry Building "Expose"
Just how expensive is rent at the Ferry Building and how much higher will they go? The Ferry Building has some vacancies these days. By now, most people have probably read the San Francisco Chronicle's big pair of articles over weekend involving the Ferry Building. The majority of the changes have already been covered around these parts already—namely, the lease-induced closures of Ferry stalwarts Tsar Nicoulai, LuLu Petite and Mastrelli's—and for the most part, the articles simply highlight the food hall's uncertain future. 1) Exactly how pricey it is: "[Tsar Nicoulai's LeiAnn Noel] thinks the shop's profits weren't high enough to satisfy Equity Office Properties Trust, the Ferry Building's principal investor. Tsar Nicoulai's rent was based on a percentage of the profits, with the base rent being more than $3,000 a month for 300 square feet." 2) Exactly how much the rents are jumping: "[Far West Fungi's Ian] Garrone said rent for his 300-square-foot store jumped more than 20 percent when his original lease expired in April 2009. That increase was enough of a shock that Garrone's family is fearful of facing the next round of negotiations in two years. 3) One more newcomer: "For balance, more kiosks are being added so that small businesses such as Benedetta, a Sonoma company selling holistic skin care products, can move in." 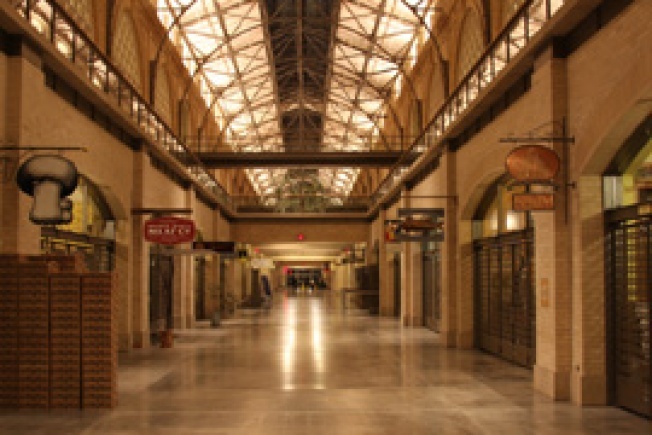 4) Not a tidbit per se, but Daniel Patterson puts a sensible spin on the increasing rent: "I kind of feel like [the Ferry Building management has] created something great and took a lot of chances. Now they deserve to reap the benefits."